Eighteen Cowley College employees were honored Thursday, December 10 for their years of service during a recognition ceremony in the Earle N. Wright Community Room inside the Brown Center. Employees were honored in five-year increments. Awards are presented annually to employees who have worked five, 10, 15, 20, 25, 30, 35 consecutive years. There has been a total of 160 years of service among the 18 employees recognized on Thursday. Cowley College president Dr. Dennis Rittle praised the work done by each individual. 5 years: Lisa Grose, Bev Frank, Kris Ripley, Courtney Gougler, Tim Walton, LaVaughan Scheurich, Jenny Hoyt, Brock Buckingham, James Wheeler, and Jamie McGee. 10 years: Chris Cannon, Jeff Fluty, Somsy Sengvixay, and Criss Kennelley. 15 years: Uwe Conrad, Frank Arnold, and Marlys Cervantes. 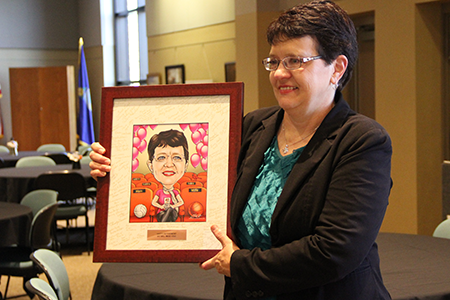 During the ceremony, the college honored Mindi Shriver, administrative assistant to the instructional office, who has served various roles at the college since 1990. Shriver plans to retire at the end of the year.